The triple jump was always going to suit Naomi Ogbeta. After all, why do only one thing when you can do three? As a pre-schooler, she signed up to a ballet class. "But then they made it compulsory that you also had to do tap dancing as well, and I was terrible at tap dancing, so I quit that aged four," she explains. She joined a song-and-dance club instead. That lasted two years before she switched to a weekend drama group. Then, leaving the boys behind in the playground, she discovered she was fast. "My mum and I were just googling 'Manchester athletics clubs' - we found one and it said that the practice was on Saturdays," she says. "That was a clash with drama, so I had the choice: try athletics or stick with drama. Barely a teenager, already a renaissance woman. Now 20, she is still swapping hats with millennial speed. Over the past 12 months, she has appeared in various guises in an Olympic Stadium, an Edinburgh Festival backroom, on network television and thousands of social media feeds. Her personal best of 14.15m makes her the third-best female British triple jumper ever, behind only Yamile Aldama and Ashia Hansen. Her senior championships debut came at the European Championships in Berlin in August, where she qualified for the final. "When I won the British Championships and got the qualifying standard for Berlin I suddenly realised: 'Oh, wait, I actually have to go and compete'. "I remember looking at the team list and thinking, I am going to be on the plane with Dina [Asher-Smith] and Harry [Aikines-Aryeetey]. "They were really friendly, but I was kind of star struck. Once I made it to the final I was like, 'I am one of you guys now'." There had been parental, as well as peer, pressure to make the final. Her mother and father had, in a show of faith in their daughter's abilities, shelled out for tickets for the medal-deciding session. 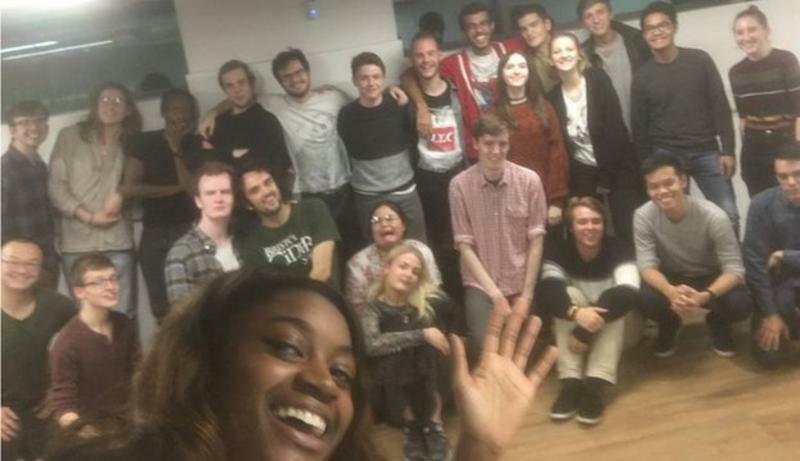 They were not in the crowd in Edinburgh though when - the week after returning from Berlin - Ogbeta, currently studying for a politics degree, travelled to the city's world-famous Fringe Festival with the University of Manchester Comedy Society. "I am scared that, because I do improv [improvisation], if someone suggests something a little bit rude... do I really want my dad to see this?" she says. "I know the experience of doing improv helps with my nerves in competition though. When I have friends in the audience I find it really nerve-wracking and in Edinburgh it was little kids, families - really different from our usual student audience." A month later, she was part of a panel of young people on BBC Two discussing Brexit and its implications - "I was so scared, it was probably the most critical of myself I have been, but it did go well" - while all the time she has been busy on social media. Whether it is a YouTube feature where she coaxes a nine-metre triple jump out of an amateur, free-wheeling Instagram vlogs everywhere from the IAAF awards in Monaco to her own backyard birthday celebrations, or her between-jumps snaps from behind the scenes, she is a one-woman online content mill. 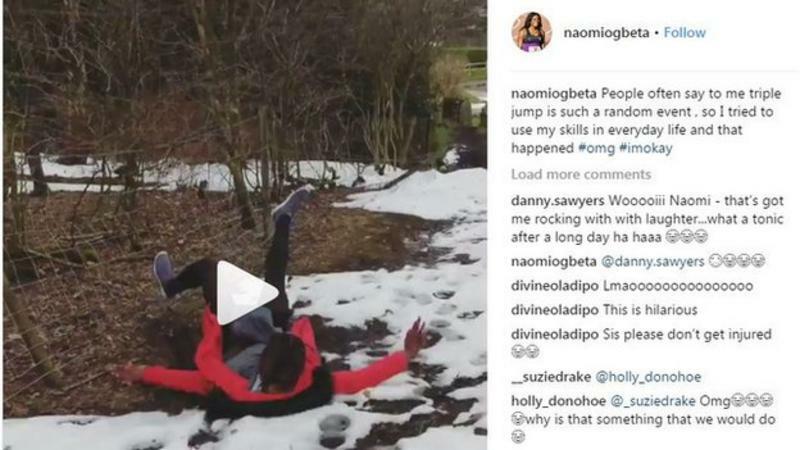 As ever with the internet, the post that has proved most popular involved things going disastrously off-script, as she skidded on to her backside while attempting a snowy rural triple jump. "I feel I can express myself how I want. Social media has been a pretty positive experience and I do enjoy it," she said. "I want to start a YouTube channel advising young athletes on making the progression to senior ranks. "That is the thing for me, being real. I don't want to pretend to be the perfect athlete who eats perfectly every day. I am a normal person who happens to be good at and loves what they do." One young athlete who has already benefitted from her influence is Ogbeta's younger brother Nathanael. The 17-year-old is an England youth footballer who is at Manchester City's academy. Last summer, before her European Championships debut, he played in the European Under-17 Championship, going out in the semi-finals to the Netherlands on penalties. "I asked him if he had been nervous because he could potentially have had to take one [a penalty]," she remembers. "He said he has watched me so many times on the runway on my own and I've still been able to execute a jump. 'If you can do that then I can take a penalty' he said. It was really nice to hear that." Ogbeta's start to this season will only have fostered more sibling admiration. In Bratislava at the end of January, she warmed up for this weekend's British Indoor Championships with a leap of 13.68 - the fourth-best indoor effort by a British woman. Online, on stage or on track, her audience is set to grow. Fast.